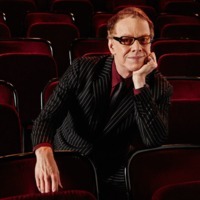 Daniel Robert "Danny" Elfman (born May 29, 1953) is an American composer, best known for scoring music for television and movies and leading the rock band Oingo Boingo as singer/songwriter from 1976 until its breakup in 1995. He is a frequent collaborator with long-time friend Tim Burton and has scored most of his films (the exceptions being Ed Wood and Sweeney Todd). He has been nominated for four Academy Awards and won a Grammy Award for Tim Burton's Batman and an Emmy Award for his Desperate Housewives theme. Elfman was honored with the prestigious Richard Kirk award at the 2002 BMI Film and TV Awards. The award is given annually to a composer who has made significant contributions to film and television music. Elfman is famous for creating The Simpsons main title theme as well as the Batman theme, and his role as Jack Skellington's singing voice in The Nightmare Before Christmas. He also sang for the character Bonejangles in the movie Corpse Bride. He is the uncle-in-law to actress Jenna Elfman.